Apart from being funny & inspiring, Veere Di Wedding was full of absolutely fabulous outfits, specially for brides and bridesmaids. The movie marked Abu Jani Sandeep Khosla’s re-entry as costume makers in Bollywood after 16 years and it goes without saying that they literally showed us what bridal dreams are made-up of! Scroll down to see all the Veere’s outfit details from the 3 major functions in the movie! Kareena Kapoor grabbed eyeballs in this stunning off-shoulder yellow and beige lehenga with muted tones of red. This Abu Jani Sandeep Khosla lehenga gave us some major #BridalGoals! FYI, Sandeep Khosla revealed in an Instagram post that the wedding garments in the film are actually from a vintage line he created along with Abu Jani several years ago. In fact, the designer explained that they had made the specific garment which Kareena wore 25 years ago! Sonam Kapoor looked a dotting bridesmaid in a pastel green lehenga skirt with pink border paired with a pearl encrusted blouse with puffed sleeves. She’s giving us major #Bridesmaids goals all the way! Swara Bhaskar wore a peach organza cape paired with slim trousers and a bustier. Totally in love with how pants too make for a stunning shaadi-appropriate-look. Another stunning bridesmaid look was that of Shikha Talsania who was spotted in a gorgeous brocade palazzo and crop top paired with a long cape and a dupatta! Kareena’s mehndi outfit look was inspired by Maasai tribal African art and motifs. That printed cropped top with bell sleeves is definitely a head turner! All you brides out there, I hope you are taking notes! Sonam’s blouse in Bhangra Ta Sajda is inspired by miniature paintings, as seen around the neck and comes with an an ornate jewelled neckline making her look phenomenal. #Bridesmaids goals? Shikha Talsania was spotted in an electric blue crushed skirt paired with a multicoloured mirror and salli work anarkali looking totally festive. Kareena is spotted in a multi-layered ombre blue ball gown with gold and silver sequins in moon and star shapes. Well, about this all we can say is, Bebo sure does look her stunning self in literally anything. Sonam wore a gold and dusty pink lehenga for her BFF’s sangeet in the movie and looked ravishing. I am in love with this fish tail lehenga skirt paired with a sequin encrusted bustier and checkered embroidery cape sleeves. If you think you are as sassy as Swara is in Veere Di Wedding, then you can definitely pull off a shimmery unicorn coloured lehenga skirt paired with that ruffled blouse. The skirt had a multiple layers of pastel sequin discs on the sleeves to create a dramatic 3D effect. Shikha wore a coral classic ghagra set with a spray embroidery with gold and silver tassel detail on the dupatta and the ghagra. Also, last but not the least, totally crushing over Sonam’s pastel saree paired with that gorgeous embellished off-shoulder blouse! 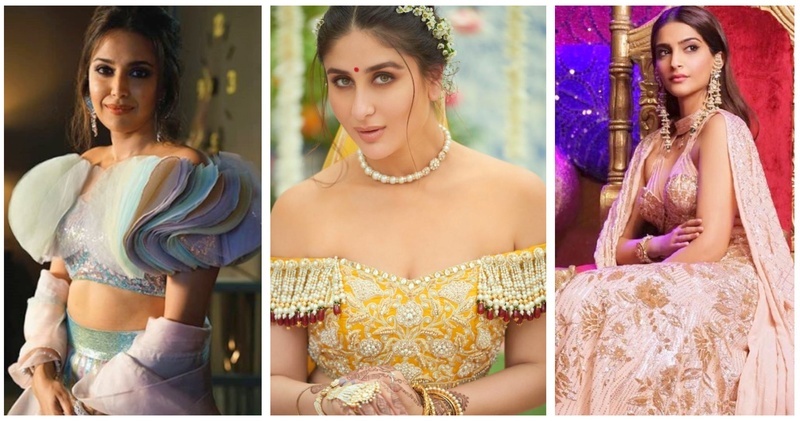 So here went all the Veere’s outfits deets from Veere Di Wedding and I dont know about you, but I for sure am wearing one of these for my BFF’s wedding this year!